There’s so much more to life than finding someone who will want you or being sad over someone who doesn’t. There’s a lot of wonderful time to be spent discovering yourself without hoping someone will fall in love with you along the way, and it doesn’t need to be painful or empty. You need to fill yourself up with love. Not anyone else. Become a whole being on your own. 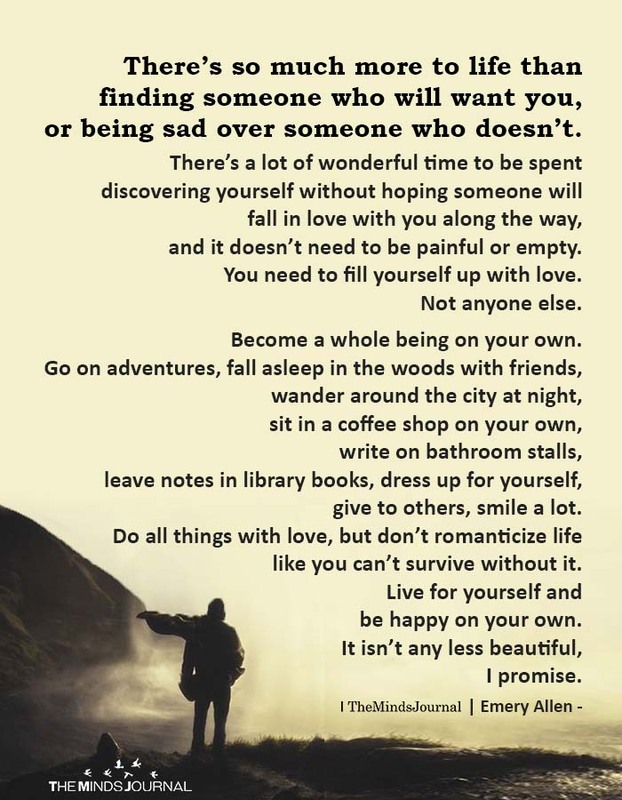 Go on adventures, fall asleep in the woods with friends, wander around the city at night, sit in a coffee shop on your own, write on bathroom stalls, leave notes in library books, dress up for yourself, give to others, smile a lot. Do all things with love, but don’t romanticize life like you can’t survive without it. Live for yourself and be happy on your own. It isn’t any less beautiful, I promise.